Head coach David Ripley believes the lessons learned during a tough 2018 will bring a more positive 2019 for the Northants squad. Last year was one of relative underachievement at the County Ground, following a five-year spell which had included two Vitality Blast titles and a further appearance in finals day. There was also a Specsavers County Championship promotion in 2013 and the team were a whisker away from a second in 2017. Having been at the helm during the successful years, Ripley was understandably disappointed by the 2018 campaign. But he says it has given everyone at the club a massive amount of motivation for their hard work in the Lyn Wilson Indoor Cricket Centre and Matrix Fitness gym. "It's been a really good winter of hard work," Ripley said. "The pre-Christmas period was about recovery, but since the turn of the year we've been concentrating on our cricket and making sure that the players are physically ready for the season. "We're happy with what we've seen from the group. "The training and intensity has been really good, and I believe we're in good shape for the various competitions this year." 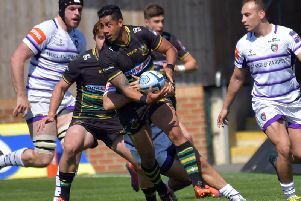 Training has been balanced between conditioning work, cricket skills and taking the players to new environments such as a dual coaching session with Northampton Saints. And Ripley has been pleased by the positive attitude shown by the squad to what has been asked of them. "We've looked to bring variety into the schedule, which keeps everyone fresh and on their toes," he said. "But you need the players to buy into it, and that has been good to see. "(Head of strength and conditioning) Chris Lorkin has worked really hard as well and there isn't a player who isn't fitter or leaner than last year." There has been a relatively high turnaround of players at the County Ground this winter, with Ben Duckett, Richard Gleeson and Rory Kleinveldt having departed and Steven Crook retiring. But with internationals Jason Holder, Temba Bavuma and Faheem Ashraaf all arriving as overseas players at various stages, Zimbabwean international fast bowler Blessing Muzarabani having signed a full-time contract and youngsters Ben Curran, Tom Sole and Charlie Thurston all progressing into the senior squad, Ripley says there is plenty of potential for success in 2019. "We've invested our overseas budget on some quality players like Jason Holder and Temba Bavuma and will be tapping into their experience," Ripley said. "Meanwhile Ben Curran finished last season in the first team, Charlie Thurston contributed to our white ball teams and Tom Sole broke into the Scotland international team. "With Alex Wakely, Nathan Buck and Rob Newton all having signed new contracts as well we think we've got a good mix of overseas internationals, experience and exciting youngsters this year and are looking forward to the season."